Our little hound will soon be pickin’ and a grinnin’ with this little banjo on his knee. 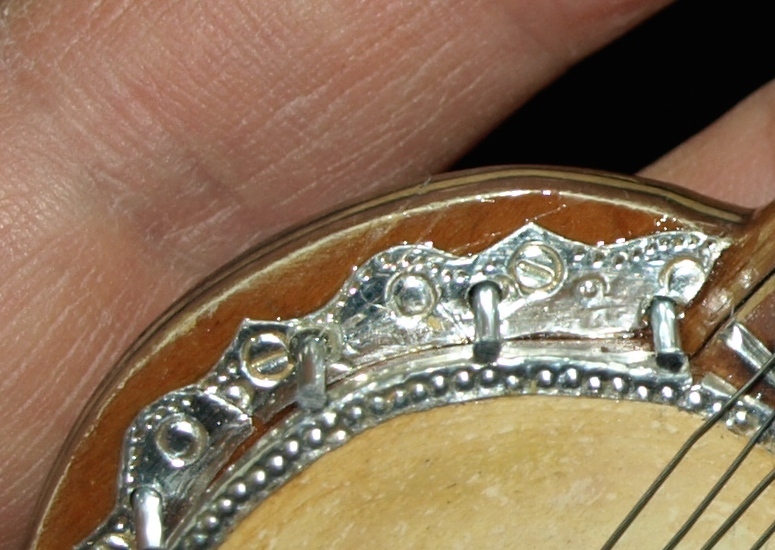 I cut the heads off of some very small, shiny finishing nails and arranged them around the tin section of the banjo. 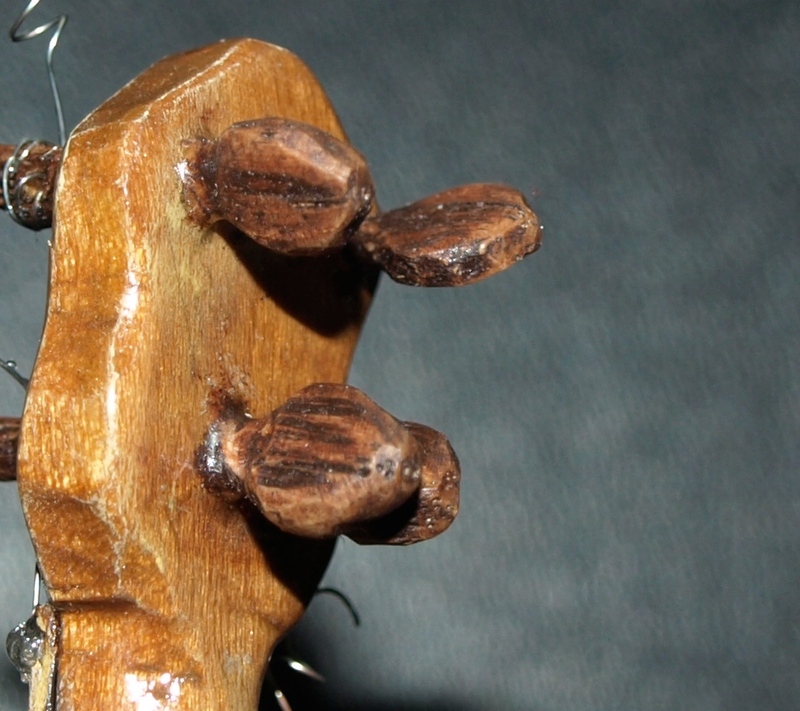 This is meant to resemble the small bolts found on full size banjos that are designed to keep the drum skin tight. Each nail is epoxied into holes that I drilled around the banjo skin. I carved some “ears”, or tuning mechanisms, for the banjo out of oak and gave them a dark stain. I then bundled some very fine wire together in five strands and epoxied it in a hole that I drilled in the base, or end, of the banjo and glued that bundle in place. 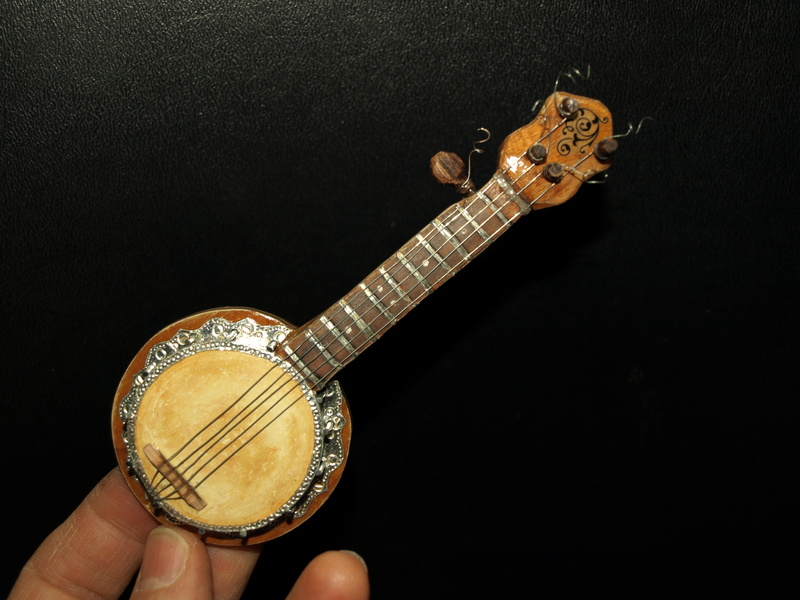 Then it was a matter of fashioning a very small bridge and gluing it to the banjo body skin to route the little strings across. After drilling some holes in the tuning mechanisms will a pin, I threaded each wire through and wrapped it around the tuning dowels and epoxied them in place. Finally, I arranged the strings evenly across the bridge and epoxied that end and the other end of the strings at the neck of the banjo so that everything would stay put. A few twists of the remaining wire around a little dowel to make the curly bits at the end…and we’ve got ourselves a little banjo. Now, that was fun. I really need to think up more reasons to make banjos. I wonder if they’d make nice Christmas Tree decorations? Well …. I see some first place ribbons in the future for this guy! Fantastic!! Thanks. I think this little carving is turning out ok and may just be ribbon worthy. Too bad there isn’t a category just for carved musical instruments…I think that I could get interested in that! At a minimum, there may be some tree decorations in the future. Mark.